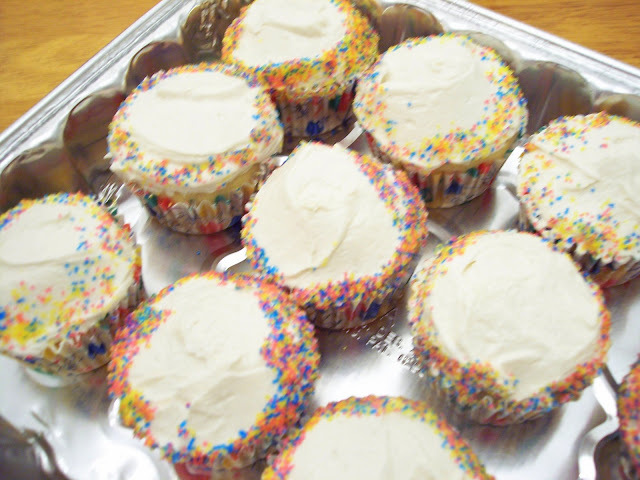 Pictured here are the other cupcakes that I made for my aunt's b-day. And, just like the chocolate cupcakes in the previous post, these are also from Vegan Cupcakes Take Over the World (of course!). So, I chose these particular cupcakes because I wanted to make something that non-chocolate lovers could enjoy, as well as something that wouldn't visually compete with the O' Chocolate Cupcakes too much. 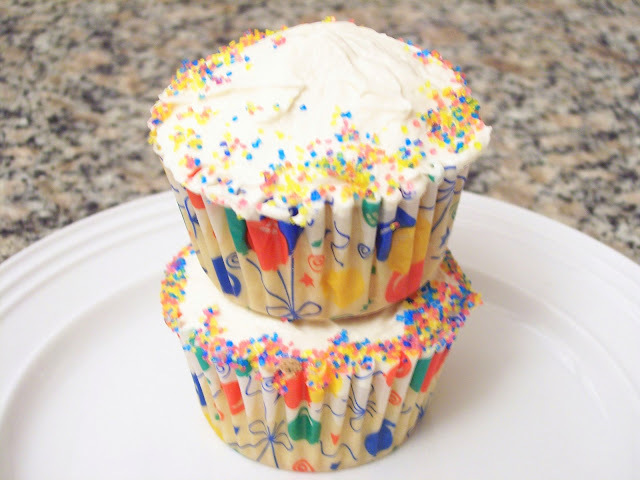 As a result, I baked the "Golden Vanilla Cupcakes" and topped them with "Vegan Fluffy Buttercream Frosting." They're simply decorated with blue, pink, and yellow candy crystals, which I accomplished by rolling the sides of each cupcake onto a plate of mixed crystals. And because I opted for ease (and uniqueness!) I decided to utilize a slightly different pattern/amount of candy for each cupcake, which actually turned out nicely. These are so cute!! I love the little sprinkles. I'll bet your aunt adored them!